New Delhi, June, 2017: Nakamuraya Co., Ltd., operator of the Nakamuraya curry restaurant in Japan, will commemorate the 90th anniversary of Japan-India Friendly Exchanges and the company’s Indian-style curry with the “Thank you for curry” campaign beginning on Monday, June 12. 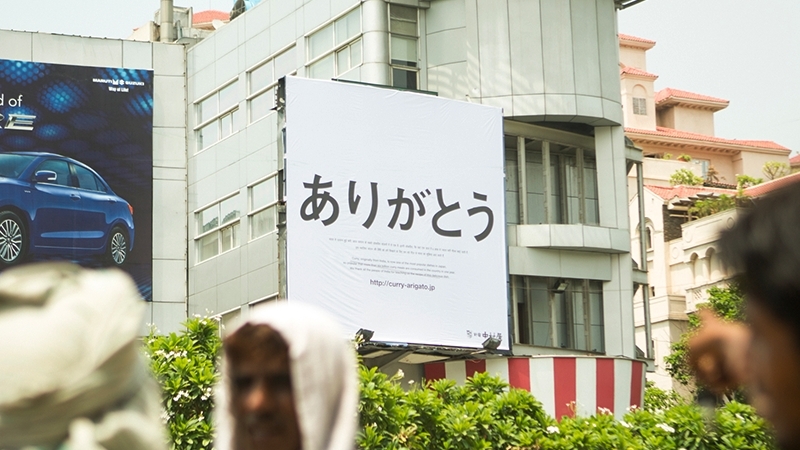 Ahead of the campaign, the company has placed a billboard in Gurgaon saying “Thank you” in Japanese. Over the past 90 years, curry has become a staple of the Japanese diet. Now, more than 6 billion helpings are served annually. As a pioneer of Indian curry in Japan, the company is spearheading a campaign to thank the Indian people for curry. As part of the two-part campaign, scheduled to run from June 12 to September 30, the company will first launch a site (http://curry-arigato.jp) that collects images with the hashtag, “#CurryDhanyavaad”, to show Japan’s appreciation for curry to people in India. Diners who post pictures along with the hashtag on social media at one of the company’s restaurants or one of several other curry restaurants in Japan also taking part in the campaign will receive a sticker depicting curry and the campaign hashtag. Later, a portion of proceeds raised during the campaign will be donated to the Japan-India Association. In doing so, the company hopes to contribute to the continuing growth of relations between the two countries. Previous Post Delhi Police’s Solution: Ban Pubs from having Ladies Night To Get The Women’s Safety Right?